Morning Routine Hack + 3 Breakfast Recipes (perfect on the go!) — The Nourishing Soul Co. Question. Would you consider yourself a night owl or morning person? Even if you despise the idea of waking up before 10am it’s still possible to set yourself up for a productive and positive day with a “morning” routine regardless of the time! Before giving meditation a try I thought it was pretty woo woo. Even though I heard good things about it I didn’t completely believe it or actually think it could help me with my problems. But when you hit rock bottom, what do you have to lose? Right? So I decided to give guided meditation a try for the first time about a year and a half ago. And like they say, it began to shift my mood and life, for the better. When I made meditation and prayer part of my morning routine I slowly found my way out of a dark hole and began to develop a positive attitude and mindset. This past year I made the effort to get up between 4-5 am on a work day and 6-7 am on a non-work day to get the most out of life and the day ahead. Waking up with intention has been a game changer for me and has helped me reach the majority of my goals I set for 2018. The routine I’m going to share is what helps me start each morning not only with motivation, but a positive attitude, and a grateful heart. This helps me realize that every day is a gift. Essentially, these reflections are the first words I feed my mind. They give me positive inspiration and remind me of God’s goodness and promises. Don’t get me wrong, I love my coffee. But this hot lemon ACV water gives me a nice natural boost of energy, naturally detoxifies my system, and hydrates my body (instead of dehydrating it from caffeine). 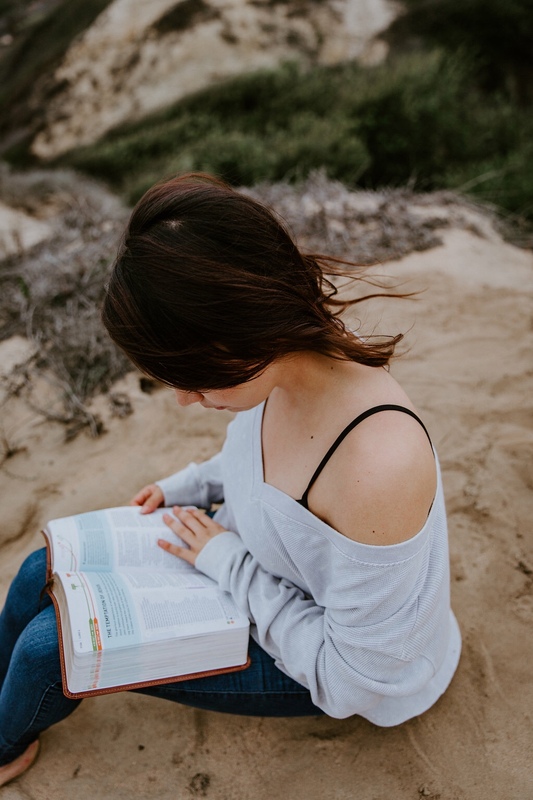 When I get into God’s word and meditate on it, it gives me a chance to connect with God and learn about Him. This is also is one way I show God that He gets first place in my life, always. There is always something to be grateful for! Writing out what I’m thankful for is another helpful reminder of the blessings I have in my life. We all have bad days and seasons but incorporating this practice into my life has helped me keep life in proper perspective. Abide Christian Meditation and Jason Stephenson are my favorite YouTube channels that offer free guided mediations! This routine takes me anywhere from 40 minutes to 1 hour. 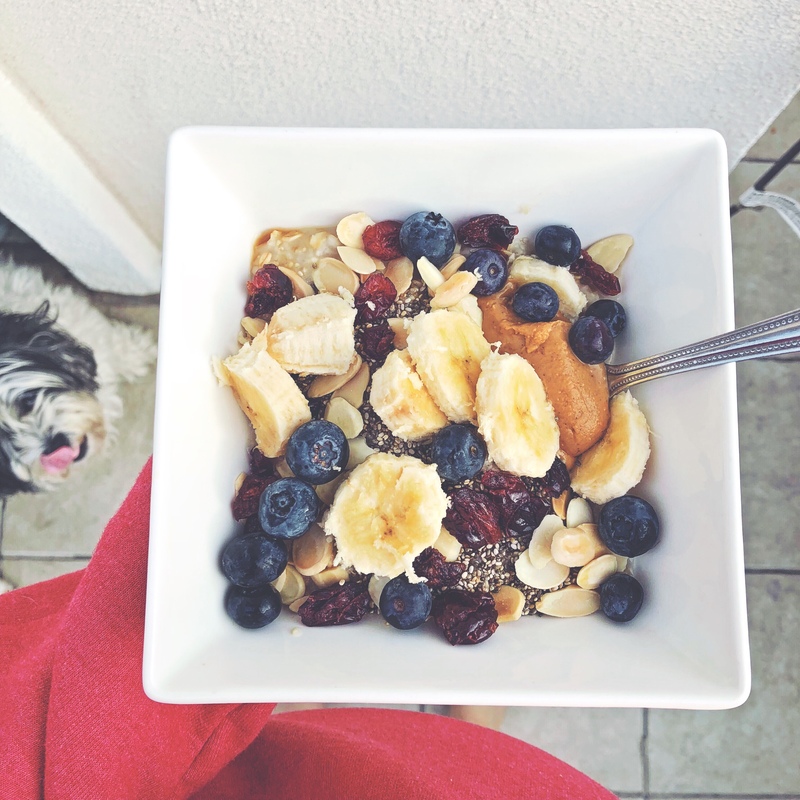 Because I’m a hungry girl (sorry not sorry lol), by steps 5-6 I’m ready to enjoy my breakfast! On the mornings I work I’m usually crunched for time so I’ve had to improvise. I’m all about starting my morning off right with a breakfast that is going to sustain me until lunch or snack-time, which these 3 recipes don’t fall short of. Aside from the nutrient packed combo each one of these breakfast jars has the best part is they can all be prepared in cute Ball Mason jars and heated up in the microwave (BPA free). Also perfect on the go (aka. Breakfast in the car)! Oatmeal is one of my all time favorite foods. But as much as I love it, if I eat the same thing day in and day out I get sick of it REAL QUICK. So, because I’m a good friend and care about you and your taste buds, make sure you rotate between these 3 recipes! Yes girl, you heard me! It can be easily done in a minimal amount of time throughout the week. The only ingredients that need to be cooked are the sweet potatoes. I like to boil my potatoes stovetop until their soft (depending on the size, which can take anywhere from 25-45 minutes). For my loaded oatmeal recipe, which is best enjoyed warm, I prepare the items in the mason jar just as you would overnight oats but instead of using milk I use water to cook the oats in the microwave right before I’m about to head out for work. 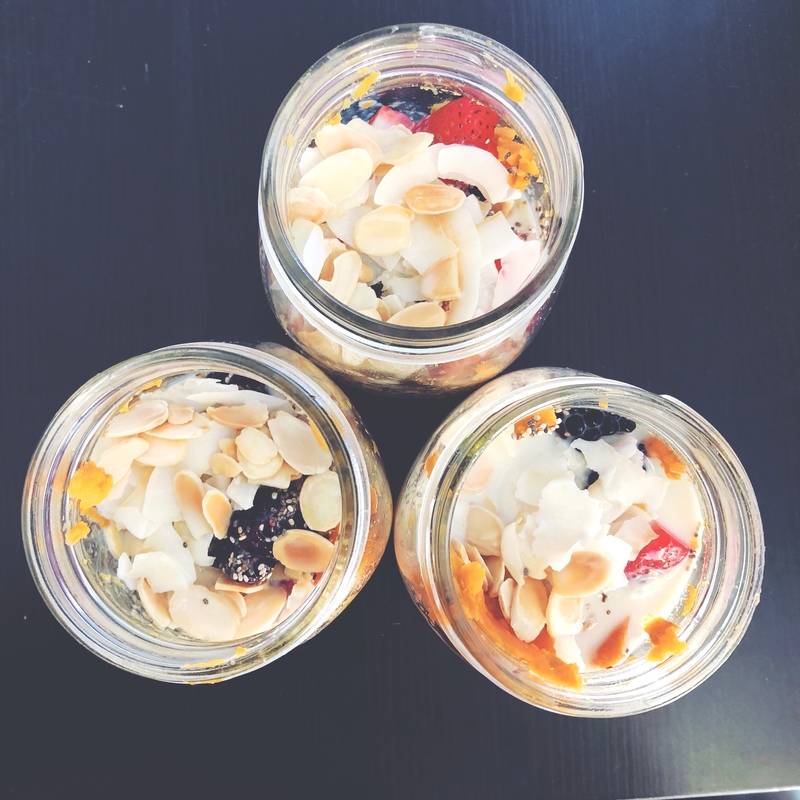 I’ve set you up with a list of all the ingredients (and links to purchase) needed for the 3 jars (if you’re ready to fully commit to this positive morning routine) as well as the individualized ingredient list (in case you want to test it out first). Combine all the ingredients together in the mason jar. I have this meal without any added sweeteners. But if the mashed sweet potato and fruit alone don’t quite satisfy your sweet tooth, feel free to add stevia vanilla drops or honey. This recipe tastes amazing hot. Just nuke it in the microwave for 1 minute and voila! I recommend adding 1-2 tbsp. of PB fit, regular peanut butter, or ½ cup of plain greek yogurt on those mornings when you need a little more protein (this will set you up for a long day ahead!). 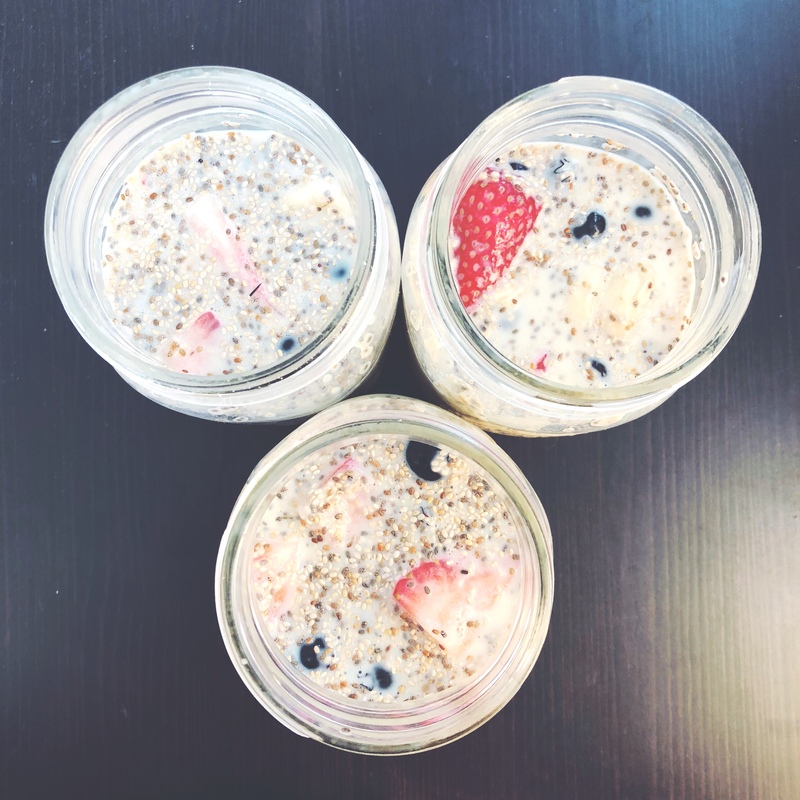 Make sure you let the oats sit overnight or at least 2-3 hours before eating so the oats have a softer consistency and the chia seeds can expand. This oatmeal has a very thick consistency. If you prefer your oatmeal to have more of a liquid texture add water or unsweetened almond/soy-milk. Add the peanut butter after you microwave the oats. You can also sub the peanut butter for PB fit for less calories and fat. So there you have it love! This routine will not only help you set your day with intention but also nourish your body, which is a win-win to me. Meditation in Depth. The National Institutes of Health Website. https://nccih.nih.gov/health/meditation/overview.htm#hed5. Accessed November 11, 2018.